S2 extended safety on 75B? Can the CZ Factory Shadow2 extended safety set be installed on a normal 75B? I've heard that the Extednded S2 safeties and TSO safeties can be rocked back and forth as opposed to having to use the move the thumb under the safety and nub it up/on safe. Anyone with experience on both of these types of safeties, please advise. Related question - Since I have the adjustable sear, would I need to heat and break the locktite on the set screw and then reset it? or would it be better to file the safety nub if needed, or just get a new Adj sear. Re: S2 extended safety on 75B? 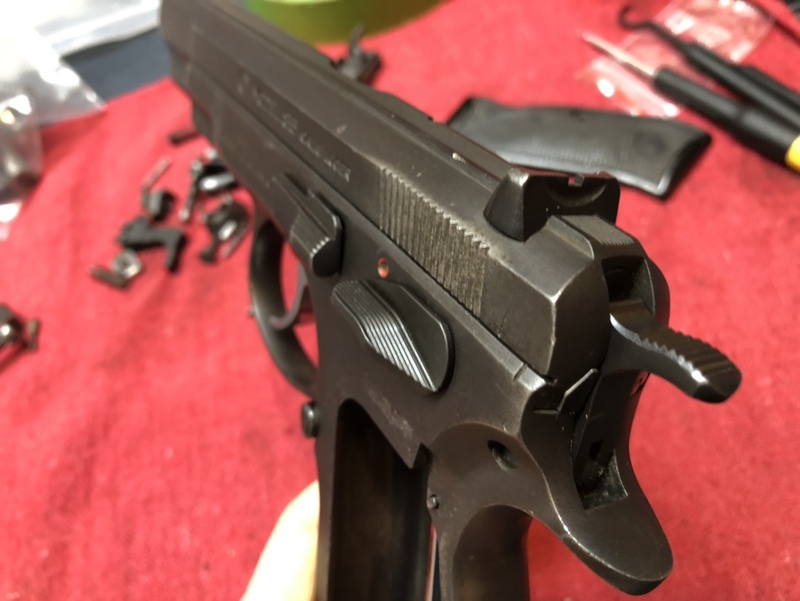 To my knowledge the CZ 75B will only accept Left side only safety levers. The S2 and TS use two part Ambi safety levers. As to the question about the replacement safety levers effect on the safety working after is is changed out, i believe that you would need to change out the safety lever first and then check its status and adjust accordingly. I would attempt to heat up the set scerw on the adjustable sear with a soldering iron but i have not had the opportunity to try this myself. I am interested to hear other forum members input on your questions and my reply. I got a shadow 2 and TSO which I use in uspsa. You can rock the safeties but it’s not like rocking a safet on a 1911/2011 using your thumb. Depending on the strength of the spring, it’s not as easy to rock it on/off. On my shadow 2, I mainly use the safety to rest my strong hand thumb. For the TSO, I find that most of the time, I still have to activate the safety on by putting my thumb underneath it. Tok36 is correct in that the shadow 2 and TSO use two part “D” style safeties. For your adjustable sear, you can use your soldering iron to loosen up the loctite so you can adjust your sear to your safety. Red loctite loosens up with heat and you can reapply new loctite once you have adjusted your sear to your new safety. It is a better option compared to filing the nubs on the safety lever which negates the use of your adjustable sear. It’s also more more in fitting the safety to the sear. It’s also more cost effective than buying a new sear. You can also use a heat gun if you have one. Thanks for the replies. The rocking the safety would be cool, but honestly I'm more looking for a good thumb rest for strong hand than anything, with quick dray safety off being second. If the normal extended safety will fit that bill, be less $$ and no bubba mods, I think I'll go that route. Thanks for the input. I've totally got soldering iron and half finished arduino projects laying around. The rocking safety your talking about is the wide safety from CZ Custom. 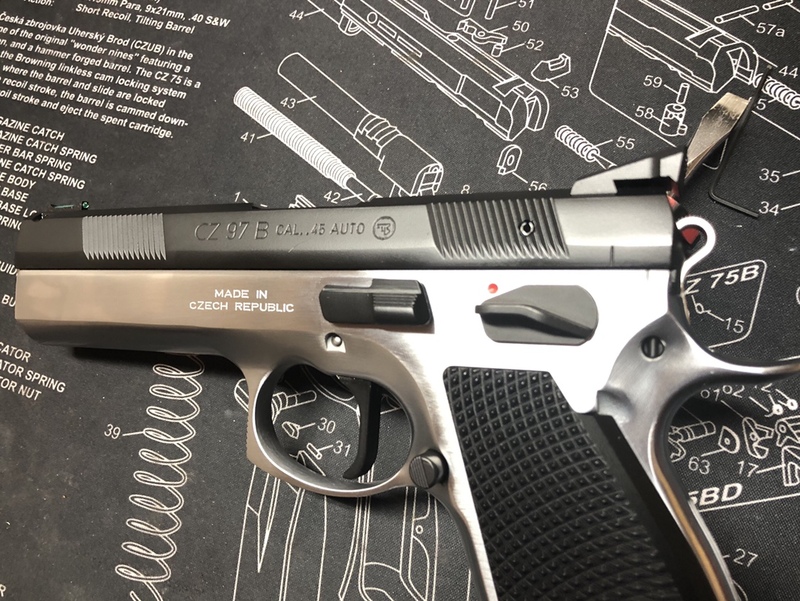 You can get a shadow 2 style safety for the 75 series now that CZ is putting that safety on the 2019 Shadow Orange, to my knowledge it has to be ordered international (I did). I have put it on my 97 and an 85 pre b.
ha, funny that this just showed up again. I just contacted CGW last week and they didn't have an option for this type of safety. I will take a look at the CZC options. how long did it take to get over here if you ordered internationally? Its good to know that option is out there. Its a bit to much $$$ for me though. I think I'm just going to go with the standard extended safety. I'll probably get a 10x bushing and a steel guide rod to round out the order. I don't see a steel guide rod for the standard 75B, do they exist, or do you have to drill the slide or something? If it dose not have a guide rod hole the slide must be drilled to facilitate a full length guide rod. Slide is not drilled for guide rod, so skipped that for now.. maybe one day. I did get a 10X bushing to throw in and got an extended safety. Saved $25 by ordering the uncut ext safety version, and will cut it myself when it arrives.